Wilde 100% Fruit Juice is packed into Elopak and Tetra Pak aaseptic cartons, which allows Wilde 100% to have an extended shelf life of up to twelve months outside the cold chain, without the addition of any sugars or preservatives. Wilde 100% fruit juice is made in South Africa using real fruit – no additional sugar or preservatives. Wilde 100% comes in a variety of four different flavours in two-litre packs (Berry, Orange, Apple and Tropical) and seven different flavours in one-litre packs (Guava, Red Grape Lite, Apple, Mango & Orange, Tropical, Mixed Berry and Orange). Wilde 100% Fruit Juice has an interactive blog that is regularly updated, see www.wilde100.co.za. Wilde Pressed is a premium fruit juice, which is pressed and squeezed. It is not made from concentrate like most juices available and it contains no added sugar or preservatives. This is the purest form of long life fruit juice. Wilde Pressed Fruit Juice is available in one-litre and 200ml size options. A 100% fruit juice like Wilde 100% contains no additives and is treated against deterioration by permitted methods. The juice can be natural as extracted from the fruit or can be reconstituted from concentrate to a natural single strength. A 100% fruit juice can also be a blend of different juices where each individual fruit juice complies with the above. 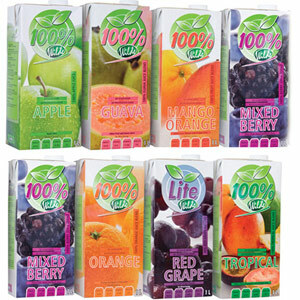 Wilde 100% fruit juice is available in one-litre, 200ml and four variants in 2 L.